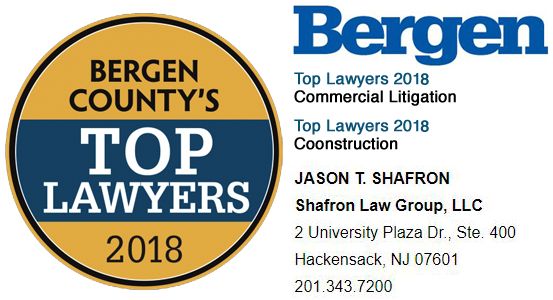 Jason T. Shafron, managing partner at the Shafron Law Group, LLC, has been named one of Bergen County’s Top Lawyers in both Commercial Litigation and Construction Law by Bergen County Magazine. Bergen County is home to some of the most prominent and sought-after attorneys in the country. Mr. Shafron was selected by his legal peers throughout Bergen County, when they were asked to select whom they deemed to be the best within their practice areas and whom they would seek out for particular legal needs.